They dared Florence to enter the haunted house on top of the hill. She is frightened, but Florence musters the courage to go inside. As she makes her way up to the top she finds many ghastly things along the way. Will she make it back out or be turned into a stump forever? 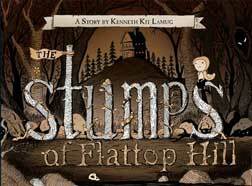 The Stumps of Flattop Hill is a macabre tale of a little girl who enters the town’s legendary haunted house in the face of fear. A dark tale for children in the tradition of the Brother’s Grimm, it calls to mind the provocative illustration style of Edward Gorey. Scary and entertaining, this book challenges the idea of what children’s books can be. Kenneth Kit Lamug is the author and illustrator of the award-winning picture book, A Box Story and the graphic adventure comic, The Tall Tales of Talbot Toluca. He is also known for his macabre illustrations in the children’s fairytale magazine Underneath The Juniper Tree. When he’s not spending time with his wife and three mini rabble boys, he creates new monsters in his underground lab.